Last week the team at iFixit undertook a teardown of the brand new Samsung Galaxy S9 Plus to examine and evaluate the device's repairability. Now analysts TechInsights have done the same thing, but with a focus on components and costs. When taking the device apart the team found Samsung's Fast 2L3 third-generation 12MP, 1.4 µm pixel-pitch Dual Pixel ISOCELL sensor in the main camera and a 12MP, 1.0 µm pixel-pitch Samsung S5K3M3SM in the tele-camera, the same as in the Galaxy Note 8 dual-camera module. 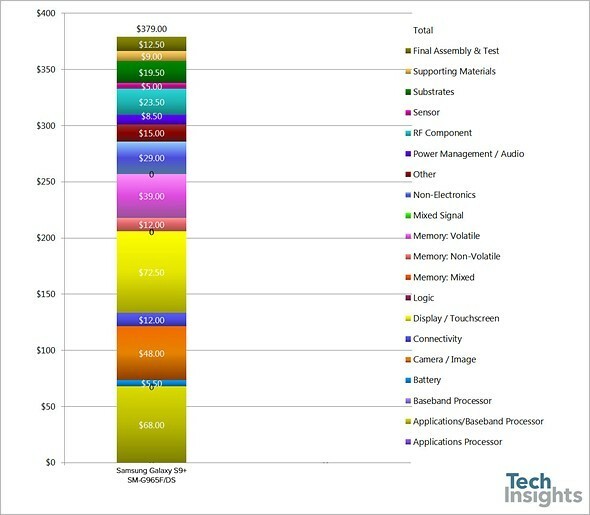 TechInsights also provides cost estimates for all components and at $48 the Samsung's camera setup is the third largest cost block on the device. Only the display at $72.50 and the main chipset at $68 have a higher impact on the overall figure. Final assembly and testing is estimated as $12.50, and the overall manufacturing cost of the device is $379. Samsung's new ISOCELL Dual module will bring dual-cameras to budget smartphonesDual-camera setups that allow for better zooming and a background-blurring fake bokeh effect have become pretty much a standard feature on flagship smartphones; however, they are still far less common on cheaper 'budget' devices. That's all about to change. The image sensor division of device maker Samsung just launched the new ISOCELL Dual camera module, which was specifically designed for use in budget devices. Samsung Galaxy A8 And A8+ (2018) Release Date RevealedRecently Samsung unveiled the new Galaxy A8 2018 Smartphones with a whole new design. Both the Samsung Galaxy A8 and A8 Plus features Dual Front Camera, a large Infinity Display and stunning ergonomic design. New Samsung image sensors use dual pixel for fast AF and fake bokehSamsung Electronics has launched a couple of new image sensor—both intended for use in mobile devices—under its ISOCELL sensor brand—the ISOCELL Fast 2L9 and the ISOCELL Slim 2x7.